Background: Diabetic foot ulcer is one of the most common problems in diabetic patients. Its treatment is very complicated and needs to be carefully monitored, because inappropriate responses to various therapeutic and surgical treatments may occur. Case Presentation: In this study, 10 patients with second and third degree diabetic foot ulcers were evaluated based on the therapeutic protocols of Iranian Traditional Medicine in Bojnurd. All the patients were hospitalized in one of the hospitals of Bojnurd during 2015-2016 and were undergoing initial treatment. The wounds of patients did not respond to common treatments, and based on the advice of an orthopedic surgeon, amputation was ordered by the physician. Patients were referred to the traditional medicine clinic for advice. The patients had various wounds on the left or right leg with severe inflammation. In other words, the patients had infectious wounds with severe inflammation. After entering the traditional medicine clinic, patients were treated with health and nutrition measures. Drug therapy in these patients is associated with the condition of the disease, and includes medicinal herbs, combined medications and modern blood glucose control drugs. Manual treatments including full back cupping every night until the end of treatment, massage therapy and leech therapy inside and around the wound, were used once every 3 to 7 days with 10 to 12 small, medium and large leeches during 10 sessions for patients. In all the patients, after 40 to 60 days of treatment, the diabetic foot ulcer was cured completely, the physical and mental status of the patients improved and the patients' blood glucose was controlled. Conclusion: Effective medicine can have effective clinical findings in the treatment of certain diseases, such as diabetic foot ulcer disease. In the treatment of diabetic foot ulcers, the use of effective medicine leads to lower costs and reduces the use of antibiotics in diabetic patients. Therefore, according to the principles of modern and traditional medicine in Iran, it can be investigated and evaluated as a new non-invasive therapeutic method with the highest therapeutic effect in the shortest time. Diabetes mellitus is a chronic disease with systemic complications that has high mortality and morbidity, which can be a huge economic burden to the health sector of any country. Therefore, this disease is one of the most important health problems in Iran and in the rest of the world. . It is the most common endocrine disorder, affecting more than 150 million people in the world and almost 3 million people in Iran, and many cases are yet unknown . It is estimated that the prevalence of diabetes mellitus will reach 300 million in 2025 and 4.4% in 2030 . Foot problems are very common in diabetics, and often require long-term hospitalization and in most cases, lead to amputation . The annual incidence of this problem in the diabetic population is between 0.1 and 4.1%, which is likely to be more than 25% in diabetic lifetime. This disorder causes amputation in 15 to 20% of sufferers . According to a 22-year-old retrospective study in Iran, this figure has increased by 30% . The diabetic foot syndrome is a set of skin disorders including ulcer and cellulitis, pineal glands, as well as gangrene and neuromuscular anomalies. Four pathological conditions including peripheral vascular disease, neuropathy, auto-neuropathy and infection together or alone are responsible for the development of this syndrome. Increasing blood glucose and leukocyte dysfunction in diabetics are important because of the increased susceptibility to infection, including foot infections. The risk factors for foot ulcer can be divided into two groups based on their ability to control external factors: small and thermal trauma, smoking and alcohol, insufficient control of sugar, obesity and lack of patient collaboration; Internal factors: male gender, neuropathy, vasculopathy, immunopathy, age, duration of diabetes disease and history of previous foot ulcer. Due to the controllability of external factors, focusing on them can greatly prevent the onset of this complication . Treatment of diabetic foot ulcers is very complicated and requires a lot of care. Also, the strategy of these treatments is to get familiar with diabetic foot ulcer classifications. Today, Wagner's and Texas's comprehensive categorizations showed the type of treatment and prognosis of diabetic foot as well. Common treatments for diabetic foot ulcer include proper blood glucose control, appropriate antibiotic treatment, necrosis tissue debridement, mechanical stress reduction, regular washing and dressing, and, if possible, correction of blood flow [8-9]. One of the major problems in the treatment of diabetic foot ulcers is the disorder of wound healing, despite the common therapeutic measures, although it may take several months or even years. These chronic ulcers, although incapacitating, are susceptible to infection, especially deep infections, including osteomyelitis, which may lead to amputation. The treatment of chronic ulcers in diabetic patients is one of the medical problems. Several therapeutic approaches have been proposed to treat these ulcers . On the other hand, the infection around the wound often occurs as a result of several organisms and covers several types of pathogens. Also, many pathogens are resistant to all types of antibiotics. So, the use of non-biotic treatments can be effective in preventing resistance to antibiotics and can be accepted by the patient. It is also less expensive . On the other hand, all treatments used to treat diabetic foot ulcers have a relative effect on wound healing or the prevention of amputation. 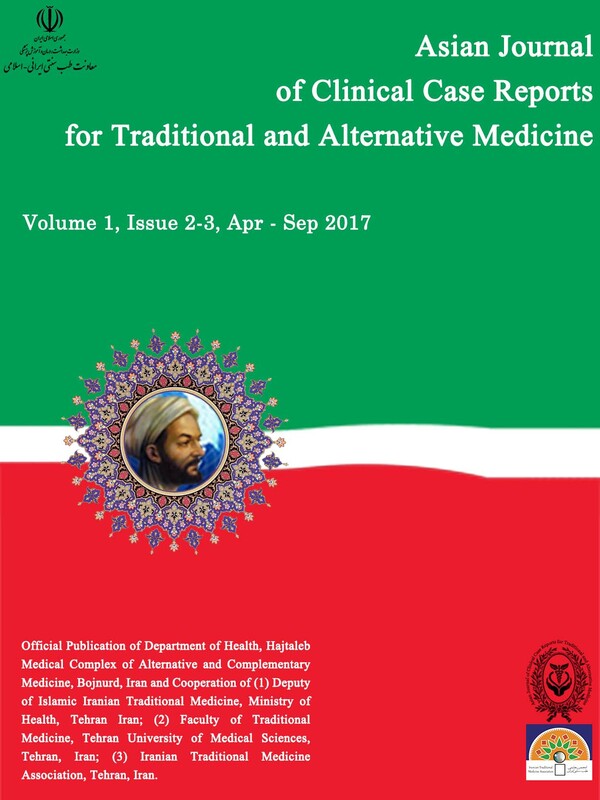 Therefore, it was necessary to evaluate a combination of modern and traditional Iranian medicine, or effective Iranian Traditional Medicine (ITM), with new methods and medications that have the highest therapeutic effect in the shortest time period, in the treatment of 10 patients with diabetic foot ulcers. Ten patients with history of diabetes and risk of various cardiac factors were used in this study. Table 1 shows the demographic characteristics and risk of cardiac factors in the patients. The patients complained of diabetic foot ulcers, which were severely infectious, inflamed and deep, with the destruction of skin and muscle tissue. The ligaments and part of the bone were seen, accompanied by fever, weakness and lack of blood glucose control. They were hospitalized in Bojnurd hospitals during 2015-2016 and underwent initial treatments including the taking of glycemic control drugs and infection control. Patients were aged 45-73 years. On average, patients had diabetic foot ulcers one month before admission. The wounds did not respond to common therapies, and the legs of all the patients were ordered by an expert physician for amputation, in accordance with the advice of the orthopedic surgeon. Patients were referred to the traditional and modern medicine center "Haj Taleb" with the guidance of one of their relatives. They were treated with tablet Glibenclamide 5 mg three times a day and tablet Metformin 500 mg twice daily, in addition to different doses of blood pressure or lipid tablets. Patients were under common treatments in addition to traditional Iranian therapeutic protocols. Grading the wound and tracking the patients' treatment processes was in accordance with the clinical examinations of a physician in a traditional medicine clinic based on the Texas University criteria for the diabetic wound classification system , and Wagner's comprehensive system criteria for diabetic foot ulcer . According to the clinical examinations by the physician, patients were based on the Texas University criteria for diabetic wound classification system (STAGE D / GRADE II, III) and the Wagner's comprehensive criteria for diabetic foot ulcers (GRADES II or III). Patients were treated with modern methods before the visit, and there was no effective treatment result. Also, the wound and general condition of the patients worsened every day. Most times the wounds are initially small and become bigger as a result of not responding to treatment. Patients also suffered from anxiety and depression as a result of foot amputation, and presented fever, weakness and palpitations due to infection and inflammation of the wound. Patients did not use proper nutrition in the prevention and sanitation context; in other words, they did not follow the recommendations of medical practitioners regarding the prevention and observance of hygiene principles. Patients did not have a good general health at the time of visit; they had physical disability, fever, anxiety and severe anxiety. They were cold-blooded and this temperament was as a result of the age of the patients, diabetes and the wounded tissues. In terms of traditional medicine, patients were excluded from balance in terms of temperament and they were severely subjected to physical exertion because of their advanced age. For this reason, the patients needed a physical rehabilitation and temperament correction before anything else. Unfortunately, the patients suffered from intensified infections, wound inflammation and severe physical strength loss due to unsuccessful treatments with modern medicine, which included antibiotic therapy, and ineffective dressing. Also, the traditional medicine commonly used by non-physicians, included non-scientific leech therapy which in general, led to frustration and severe distrust in patients. The patients’ innate temperament (congenital) were cold and wet, and their acquired temperament (current) were associated with melancholic and phlegmatic temperaments, so that their wetness was higher. Given that the patients were old and also drug addicted, their dry bowel were obvious. According to examinations, the patients had weak pulse with little intensity. In touching the patients’ body, despite the dominance of phlegm, there were also clearly dryness, and had constipation and inappropriate defecation. They had had mental and nervous depression and was highly anxious. There was no problem with respect to heart auscultation, and no any problem with abdominal examination. In general, the patients did not have any serious medical problem in clinical examination other than the infectious diabetic foot ulcer. These measures were first accompanied by nutritional and necessary recommendations. A CD containing nutritional guidelines was provided to the patients in order to promote the treatment process by understanding the principles of nutrition in traditional medicine. Also, it was recommended that the diets of patients be observed with the help of modern and traditional medicine knowledge. Patients were advised on one hand, to avoid cold, pickles, fast food, and overeating. On the other hand, they were encouraged to consume different vegetables instead of salads, to regulate their sleep and wake-up cycle and for comfortable excretion of stools at least one or two times a day. Their companions and friends were advised to deal with the patients in a friendly manner, as a result of their depression. Diabetic patients were advised not to smoke cigarettes. In these patients, medicinal herbs and hybrid drugs were used in regard to temperament and disease status. Also, the recommendations for the modern treatment of diabetic patients including the administration of tablet Glibenclamide, 5 mg twice daily, were also given to the patient. An attempt was made to prescribe medications with proper use of herbs and their active ingredients. Therefore, the plants used had the following properties (1) helped to control blood glucose; 2) have anti-inflammatory properties; 3) have antimicrobial properties; 4) are warmer and dryer, to help in the blood flow and dryness of the wound. Accordingly, the prescription of drugs was in the following three ways. (a) The first method involves oral medicines: aimed at affecting the tempering condition, improving the immune system and improving the body's physical fitness. 1- Boiled nettle + Galga + Stoichkhodos + cinnamon: These plants were combined in equal proportions, then peeled, and a spoon of it was boiled in one and a half glasses of water, then two cups were consumed per day until the end of the treatment period. 2. Sodden Chamomile + marshmallow + Thyme: These plants were combined in equal proportions, then peeled, and a spoon of it was boiled in one and a half glasses of water, then two cups were consumed per day, until the end of the treatment period. (b) The second method involves the drugs used for the colostrum: this is due to the local impact on wound healing, disinfecting it and helping to reduce the wound inflammation. Turmeric Millet + Flaxseed + Honey: One of the best herbal supplements can be made with turmeric and flaxseed because these two plants act as dryer in the treatment of wound and remove moisture and dirt from the wound due to their strong antimicrobial property. These two plants were combined in equal proportion and mixed with honey, then put on the patients' wound until full recovery. Of course, these two plants had laboratory approvals in terms of microbes. (c) The third method involves the use of drug for massage. Sesame Oil: This is the best medication used in the massaging of these patients; it helps to increase blood flow as well as local and general energy. Massage was done slowly several times with sesame oil every night, until the complete improvement of the wound. 1. Full back cupping every night until the end of the treatment stages; 2. Leech therapies inside and around the wound once every 3 to 7 days with six small and medium sized leeches for ten sessions. Patients underwent 10 sessions of leech therapy and the sensitive stages were imaged. In the leech therapy, the following cases were considered according to the age of the patients and the overcoming of soda and melancholy: A) Given the patient's anaemia and dominant phlegmatic temperament and also to prevent phlegmatic disease due to blood loss by leeches, the patient drink was increased and smaller leeches were used. B) To maintain physical force in patient during leech therapy, the periods between leech therapies were enhanced at two stages of leech therapy to give a natural reconstruction opportunity to the patient's body. If necessary, and in accordance with the physician's decision, all the wounds should be debrided before leech therapy and the wound environment should be ready for further treatment measures. Considering the combination of therapeutic methods of Iranian modern and traditional medicine, the general condition of patients significantly improved after the third to fifth weeks, to the extent that fever, weakness, anxiety and stress were not observed. The vital signs and blood glucose of patients were controlled and maintained in the normal range. One week after the beginning of the treatment, granulation tissue developed in the wounds and the ulcers were completely cured within a period of two months. Inflammation and infection of the feet of patients were completely cured after forty to sixty days of the treatment. Figure 1 show the pre-treatment and post-healing images of patients' wounds. Diabetic foot ulcer is a common medical problem of type 2 diabetes due to the difficulty in response to treatment. Due to the high prevalence of diabetic foot ulcers among diabetic patients in Iran, more effective and cost-effective treatment methods are needed [12-14]. Therefore, due to the high costs of treatment, long-term hospitalization and also, high percentage of amputation, various methods have been used to treat diabetic foot ulcers around the world, and new therapies are under investigation [15-16]. The patients studied in this report had diabetic foot ulcers that did not respond to common and conventional treatments. Today, all the treatments used to treat diabetic foot ulcers have a relative effect on wound healing or the ability to prevent amputation. Over the past decade, new solutions have been introduced to treat diabetic foot ulcers, these reduce the size and treat diabetic wounds. Presently, several local medicines have been introduced to improve diabetic wounds. In addition, several studies have shown the positive effects of herbal medicines on the treatment of diabetic foot ulcer [17-25]. Various studies have shown that modifications towards a healthy lifestyle such as the consumption of healthy food, proper nutrition, exercise, non-smoking, and good mental health can increase health indicators even in an individual with diabetes, and the risk factors and complications of diabetes can be significantly reduced [20-24]. In this study, nutritional and essential recommendations were made in the form of a CD containing the nutritional guidelines for the patient to help in the treatment process by familiarizing and observing the principles of nutrition in traditional medicine. According to the documentation in traditional Iranian literature, there is no therapeutic prescription for diabetic foot ulcer. On the other hand, there is no definition of wounds in the old texts which has the full properties of diabetic foot ulcers [26-28]. Therefore, with the use of basic sources of traditional medicine in Iran and the knowledge of physiopathology and semiotics of modern medicine, drug therapy is selected and prescribed for patients. In the discussion of drug therapy, the overall goal of treating these patients was to use the proper nutrition of the plants and their active ingredients at the same time, as observed in prescribing drugs. In these patients, medicinal herbs including nettle, gallagra, stoichkhodos, cinnamon, chamomile flowers, hollyhock, edible thyme and turmeric with flaxseed and honey were used as antiseptic, anti-inflammatory and sedative soda and laxative plants. In the choice of therapeutic methods in ITM, the effective material is very important and temperament is in the next stage. It means that plants that have strong anti-inflammatory and antimicrobial properties in terms of effective material and consistent with the patient's temper, were chosen. In the method of effective medicine, the pathologists does not always prescribe as compared to the traditional medicine, but the simple poor temperament modification is simply resolved, and the drugs with the required active ingredient are used; and if needed, a reformer is used to treat poor temperament. This method of herbal therapy in which both active ingredient of plant and temperament of patient are considered, was used for the first time, in the form of scientific and practical work of medicine because temperament is not reported in modern books and active ingredient is not reported in traditional medicine books. Combining these two types of knowledge is very complex in herbal medicine and has been used for many years in research on treatment using effective medicine method. Honey has been used for healing wounds for centuries. There are many reports on the effectiveness of honey in the treatment of wounds; scientific evidence that supports this treatment is very little. Several clinical studies have shown the effectiveness of honey in treating wounds and burns, but the use of honey is still limited to non-standard treatments. Studies have also shown that honey prevents bacterial growth. But the mechanism of this work is not fully understood. In these patients, daily dressing with honey accelerated the patient's wound healing process and no infection was observed in the wound [22-24, 29-31]. Unfortunately, there is no study on leech therapy in Iran. In these patients, a lot of blood could not be produced due to increased age and weakness of the body. Also, due to the Phlegmatic temperament of patients, it was not permissible for blood to be taken and the relative contraception of leech therapy and blood therapy is in traditional medicine. The leech therapy approach in these patients was saliva therapy and there was no need to bleed. However, because leech does not provide saliva until it takes blood, bleeding was done with the preservation of the following tips: A) The drinking quantity of patients were more and small leeches were used. B) The time interval between leech therapies was increased in the two stages so that the patients’ body can regenerate naturally [29-31]. In these patients, only Saliva leech was helpful in the treatment, and salivary agents treated diabetic wound with anti-inflammatory, revascularization and antimicrobials properties, with an increase in blood flow. Finally, with regards to the medicine process during the last century, it can be said that there is no complete school of medicine in the world of medicine; hence, the schools of medicine such as modern medicine, traditional medicine of Iran, Ayurveda in India, Chinese Medicine, etc., have many weaknesses and strengths because of incompleteness and non-comprehensiveness in the preservation of health and human treatment which is the true purpose of medicine while rendering the medical services. Effective medicine can provide effective clinical findings in the treatment of certain diseases such as diabetic foot ulcer. In the treatment of diabetic foot ulcers, the use of effective medicine leads to lower costs and reduces the use of antibiotics in diabetic patients. Therefore, the principles of modern and traditional medicine in Iran, can be investigated and evaluated as a non-invasive new therapeutic method with the highest therapeutic effect in the shortest time. Levin ME. Pathogenesis and general management of foot lesions in the diabetic patient. In: Bowker JH, Pfeifer MA, editors. The Diabetic Foot. 6th edition. New York: St. Louis, CV Mosby; 2001. Wild S, Roglic G, Green A, Sicree R, King H. Global prevalence of diabetes: estimates for the year 2000 and projections for 2030. Diabetes Care. 2004; 27(5): 1047-53. Wieman TJ, Smiell JM, Su Y. Efficacy and safety of a topical gel formulation of recombinant human platelet-derived growth factor-BB (becaplermin) in patients with chronic neuropathic diabetic ulcers. A phase III randomized placebo-controlled double-blind study. Diabetes Care. 1998; 21(5): 822-7. Larijani B, Afshari M, Bastan Hagh MH, Pajouhi M, Baradar Jalili R, Moadi M. Prevalence of lower limb amputation in patients with diabetic foot ulcer in Imam Khomeini and Shariati hospitals, 1979-2001. J Med COUNCIL Islam Repub Iran 2005; 23(1): 25-9. King H, Aubert RE, Herman WH. Global burden of diabetes, 1995-2025: prevalence, numerical estimates, and projections. Diabetes Care. 1998; 21(9): 1414-31. David K McCulloch, Richard J de Asla. Management of diabetic foot lesions. UpToDate. 2010. Oyibo SO, Jude EB, Tarawneh I, Nguyen HC, Harkless LB, Boulton AJ. A comparison of two diabetic foot ulcer classification systems: the Wagner and the University of Texas wound classification systems. Diabetes Care. 2001; 24(1): 84-8. Wagner FW. Supplement: algorithms of foot care. In: Levin ME, O Neal LW, editors. The diabetic foot. 3rd edition. New York: St Louis (MO), CV: Mosby; 1983. Larijani B, Afshari M, Darvishzadeh F, Bastanhagh MH, Pajouhi M, Baradar Jaili R, et al. Lower limb amputation in patients with diabetic foot ulcer: A 22 year review. MJIRC 2006; 8 (3): 21-4. Alberti KG, Zimmet PZ. Definition, diagnosis and classification of diabetes mellitus and its-complications. Part 1: diagnosed and classification of diabetes mellitus, provisional report of WHO Consultation. Diabet Med 1998; 15(7): 539-53. Ataei Fashtami L, Esmaeili Javid A, Kaviani A, Ardeshir Larijani MB, Razavi L, Salami M, Fateh M, Fatemi SM, Mortazavi SMJ. The role of laser therapy in treatment of diabetic foot ulcers: a randomized, double-blind clinical trial: Medical Laser 2008; 5(1): 6-11. Kazemikhou N, Khamseh ME, Hashem Dabbaghian F, Hajizadeh M, Akrami SM. The study on the effects of low-power laser in treatment of diabetic foot ulcers grades 2 and 3 (short report). Iranian Journal of Diabetes and Lipid 2008; 8(1): 195-202. Kargar S, Javadzadeh Shahshahani H, Tabkhi N. The effect of platelet gel on treatment of diabetic foot ulcers. Research Quarterly of Blood 2009; 6(2): 283-91. Ardeshir Larijani MB, Afshari M, Fadaei M, Bastanhagh MH, Jalili R, Pajouhi M. Study on the Effect of local epidermal growth factor on wound healing in diabetic foot. Iranian Journal of Endocrinology and Metabolism 2003; 5(2): 107-110. Moudi H, Akbari A, Ghiasi F, Mahmoudzadeh Sagheb H, Heidari Z, Rashidi H. The Impact of transgression Vacuum-compression therapy (VCT) on healing the diabetic foot ulcers. Scientific Journal of Zanjan University of Medical Sciences 2006; 14(1): 15-22. Bahrami A, Ali Asgarzadeh A, Sarabchian MA, Mobseri M, Heshmat R, Ghoujazadeh M. Double blind clinical trial for evaluating the effect of oral Angi Pars drug on chronic diabetic foot ulcers. Journal of Endocrinology and Metabolism 2009; 11(2): 647-55. Kashef N, Shojaeifard A, Esmaeili Javid A, Mohajeri M, Rezaei R, Salami M, Ghodsi M, Fateh M. Study on the low power laser in treatment of chronic diabetic foot ulcers: microbiological quantitative assessment. Medical Laser 2009; 6(1): 31-35. Ardeshir Iarijani MB, Afshari M, Bastan MH, Pajouhi M, Baradar Jalili R, Maadi M. Study on the prevalence of lower limb amputation in patients with diabetic foot ulcer at Shariati and Imam Khomeini Hospital from 1969 to 2001. Scientific Journal of IRI Medical Council 2005; 23(2): 25-29. Keshavarzi A, Larijani B, Mohajeritehrani MR. Modern treatment of diabetic foot ulcer (reviewed article). Scientific Journal of IRI Medical Council 2011; 29(1): 376-90. Alamiharandi B, Alamiharandi A, Siavashi B. A review of diabetic foot ulcers and its new therapeutic approaches. Journal of Iranian Surgery 2008; 16(2): 1-7. Ghanei L, Harati H, Hadaegh F, Azizi F. Study on the impact of lifestyle change on incidence of type II diabetes over a 3.5-year study: Tehran Lipid and Glucose Study. Research on Medicine 2009; 33(3): 21-29. Khadem Haghighian H, Koushan Y, Asgarzadeh AA. Report of a treatment case of diabetic foot ulcer using propolis heated in olive oil, (brief report). Journal of Knowledge and Health 2011; 6(4): 35-38. Zahmatkesh M, Rashidi M. Report of a treatment case of diabetic foot ulcer by topical honey and olive oil. Medicinal Plants 2008; 8(2): 36-40. Amini S, Rezaeihomami M, Anabestani Z, Shayganmehr Z, Ardeshir Larijani MB, Mohajeri Tehrani MR. The effect of low-frequency ultrasound on diabetic foot ulcers with osteomyelitis in a randomized clinical trial. Iranian Journal of Diabetes and Metabolism 2011; 10(1): 543-52. Hajtalebi H, Khani Iurigh H, Hajtalebi HR. Treatment of Diabetic Foot Ulcer in a 58-year-old Turkman Patient based on Iranian Traditional Medicine. Trad Integr Med 2016; 1(4): 151 -59. Hajtalebi H, Khani Iurigh H, Hajtalebi HR. Treatment of 20 Patients with Diabetic Foot Ulcer Grade 2 and 3 on Iranian Effective Medicine on, A Comparative Study with Low level laser therapy. Journal of Lasers in Medicine 2016; 13 (2-3): 32-41.